The discovery, development and clinical application in medicine and dentistry has been described and illustrated extensively in two books by Elaine Williams-McClarence: A Matter of Balance (1992) and Close to the Edge – Brånemark and the development of Osseointegration ( 2003) and the book The Book On Osseointegration by Brånemark et al. (2005), published by Quintessence books-Berlin, Germany. 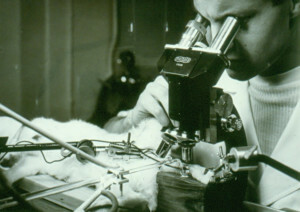 During vital microscopic studies in animal and man of blood as a mobile tissue, even in bone and marrow in animals, an optical titanium chamber was used, being implanted. It turned out to be extremely difficult to remove for further use. After several years, when I moved from Lund to Gothenburg 1959 working with orthopaedics and plastic surgery, came the possibility to use the experimental findings in some clinical situations e.g. secondary clefts, joint prostheses and limb prostheses. Later on tumour defects were also considered in our international collaboration. Because I was a counsellor for PhD students in different dental and medical professions I could assemble a wide range of doctoral theses on tissue reaction and healing, even in irradiated tissue. This also enabled me to see a large number of patients with defects in various parts of their body. I obtained in the late -50ies a maior research grant from NIH to study the formation and release of new formed erythrocytes into the bone marrow sinusoids, which were my special interest. This made me relatively independent and also allowed requiring special equipment. At the department of plastic surgery in Gothenburg, Sweden there was a patient with a secondary cleft, who lost his lower teeth. Since we had repaired mandible and tibia defects in big dogs using titanium screws and plates with immediate loading, we suggested for this patient installation of titanium fixtures in his lower jaw to anchor a bridge, so that he could stabilize his upper obturator, being there because of the remaining not repaired maxillary defect. The procedure was uneventful, so that from 1965 the patient has had a fixed bridge in the lower jaw. The maxillae was grafted in the -80th, but did not give possibility for a fixed bridge. However, with the advent of the zygoma fixture later on, the patient has enjoyed upper and lower fixed teeth and a closed maxilla. The reason why the material Titanium was chosen was because of our collaboration with The University of Chalmers, in Gothenburg, we considered various material alternatives. By coincidence, an orthopaedic surgeon, Hans Emneus, in Lund, was studying different metals used for hip joint prostheses. At that time I happened to meet him and he indicated a new metal, titanium, from Russia used in nuclear industry, that might be optimal. I managed to get a sample from Russia via Avesta Jernverk, Director Gauffin, and from there on it has been pure Titanium. Initially we tried Tantalum, which was too soft. The experimental results were presented at local dental and medical meetings and published in national health care journals. The reaction – indicating serious disbelief, suggested that titanium in bone should not be used in human, in fact not even in dogs. 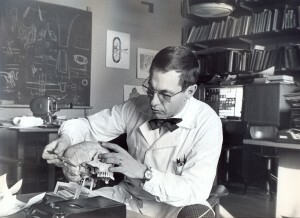 Professors Skalak and Zarb suggested an international conference to be held in 1982 in Toronto, to explain Osseointegration, it’s biology, mechanics and applicability. The first day of the 2 day conference was quite negative, but the second day accepted the clinical possibilities and prognosis, and that was the decisive event. I fully know and respect that Osseointegration in dentistry and medicine, is the result of decades of international, open minded, unprejudiced cooperation and communication, a willingness to share results, problems and ideas. The commercial influence was a necessary step, but it is imperative, that requirements on new procedures, materials and interfaces are thoroughly examined in long term, multi clinical studies before released to general use. There is one particular problem, related to a tendency to concentrate on hardware, and to forget the decisive effect of functional load on the healing process and remodelling of bone and marrow. The energy at the interface is controlled by the body elements of the patient particularly if they suffer from some auto immune decease, have received therapeutic radiation, or some other influence. It is remarkable that we have a more demanding control procedure to accept a new drug, than what and how we introduce a piece of metal to anchor in bone for a life time, penetrating permanently skin or mucosa membrane. The mouth is an much more important part of the human body than medicine and controlling agencies recognize. The edentulous patient is an amputee, an oral invalid, to whom we should pay total respect and rehabilitation ambitions. Less is more. That is our ambition when it comes to dimensions and numbers of anchoring elements. But that presupposes functional load of a dimension and direction, that does not allow undue stress and strain to damage and destroy the bone tissue and it certainly involves careful maintenance of the integumentum, that is broken. Finally, in earlier days, high age was associated with almost inevitable edentulism, with consequences for personality, nutrition, communication etc. It is gratifying that even that group of patients now can receive rehabilitation of oral and mimic function, even at the age of 90 years, with the same results and prognosis as for the middle aged. The decisive factor is how to allow the relevant tissue to heal, and integrate, possibly requiring special attention. And finally, via osseoperception, the dentate mouth communicates with the brain, possibly improving not only daily function, but also being an important factor in restitution after intra-cranial vascular events. – That is another reason to include the mouth in considerations on respect to what we install in any part of the body.